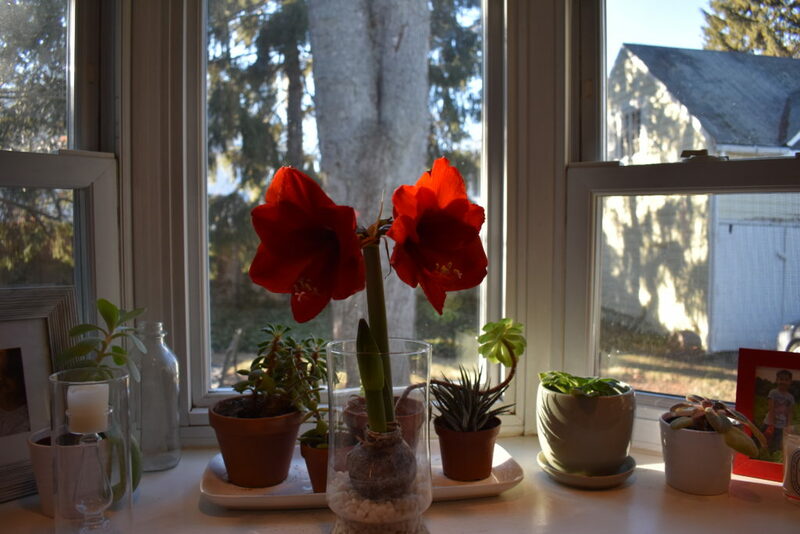 Every year around Thanksgiving I buy one of those ubiquitous amaryllis bulbs that appear at stores in conjunction with the cacophony of endless holiday music. It’s become a part of our Advent tradition to wait and watch and keep time with this flower bulb as Christmas Day approaches. The tightly closed bud looks almost grotesque as it emerges and quickly starts to rise, and the transformation is surprisingly fast. Sometimes in the morning it seems six inches taller than it was the previous night. Usually by Christmas, one or two brilliant red flowers have bloomed; each flower with its four individual blossoms. They are so heavy that they fall over if I don’t let the stalks rest against something. It is hard to believe that so much life unfolds out of such an unassuming bud. Where does it even fit? How is it vacuum packed into that tiny package? How is this sum of beauty so much greater than its parts? You may be wondering why I’m writing about our Advent tradition when Ash Wednesday ushers in the Easter season this week. Well, this year our bud just didn’t rise. Or at least if it did, it rose so slowly it was imperceptible. “I think it grew a tiny bit, don’t you?” I’d ask Audrey hopefully some mornings. She wasn’t as optimistic. Though I usually buy the bulb in a pot with soil, this year I only found it sitting in white pebbles in a glass jar. I wasn’t sure exactly how to water it in this setting and she thought maybe it wouldn’t grow. 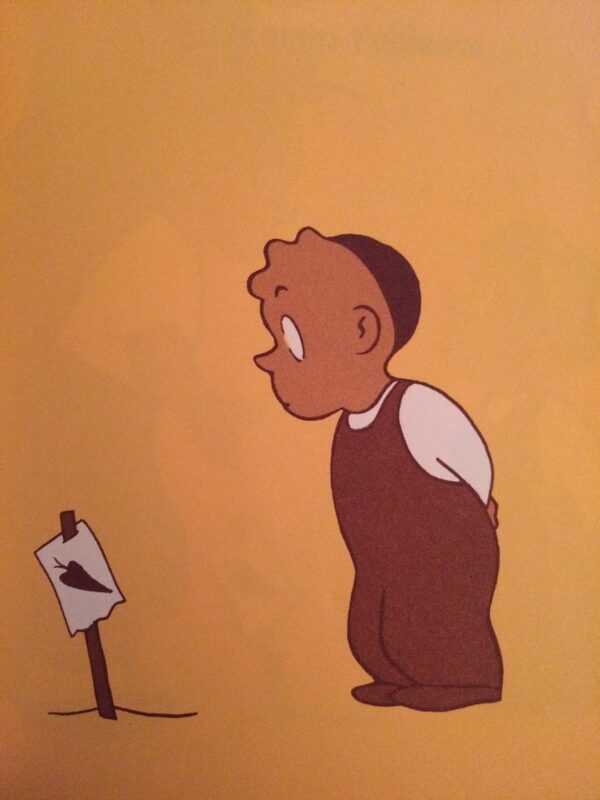 If you haven’t read it, you can still probably guess how it ends, “And then, one day…a carrot came up…just as the little boy had known it would.” It’s one very large carrot that he needs to haul away in a wheelbarrow on the last page. I fell in love with the simple story and purchased it after Dan died. It seemed more important then than ever to instill this kind of “hope against hope” in my child. The little boy appears almost like a baby, and he never utters a word himself in the whole story, not a word of defense or self-doubt. He simply stays faithful to the task despite everyone else’s negativity and certainty that he was wasting his time. It’s a picture of child-like faith, and a different kind of knowing that children have and grown-ups often do not. It’s a picture of patience. There is a verse in Hebrews that talks about running the race with endurance, and I have also seen it worded with “perseverance” instead of endurance. But in the King James translation the word that is used is patience, “Let us run with patience the race that is set before us.” At first I thought patience brought a different meaning to the verse, but then I realized that it’s actually the same as enduring or persevering because it’s more than just “waiting.” Patience comes from the Latin patientia which means “suffering.” It’s a forbearing kind of waiting. It means disappointment and doubt and thinking that maybe we’ve been forgotten or maybe we’re wrong after all. It means that we’re not certain of the sudden turn of the fairy tale’s happy ending or the little boy’s giant bounty in the form of a carrot. But still, we keep watering and weeding, and waiting. It’s not a passive act, but an active gesture of hope, this waiting. We keep tugging at the weeds that might choke it, and sprinkling, not dumping, but sprinkling—what we know brings life. Sometimes there is very little progress. Sometimes, there is absolutely none. Pages of nothing came up, and nothing came up, and everyone keeps telling you that nothing will come up. Christmas comes and goes. It was early February when our first flower emerged. Now, a few days before Ash Wednesday, a second bud has bloomed. They are just as lovely as they would’ve been at Christmas. I’m glad that I kept watering and watching and waiting. The flowers didn’t “arrive” during the season of Advent—a word that means “arrival,” but they have persevered right up until Lent, the season of “bright sadness” and spring. We live in a culture of immediate gratification. We talk about fake news, but we fail to notice fake reaping. We have become accustomed to the reward without the wait. There is same day delivery. We can order a car service on our phone and they pull up to our door in a matter of minutes. We expect people to text us back immediately. But sowing isn’t just about the planting of the seeds, it’s also about the waiting time in between. I’m afraid I’m forgetting how important this part is. The waiting looks like sitting down to write for hours with no immediate sense of praise or acknowledgement from someone else. It means taking risks and investing time, money, and resources, with no certainty of the outcome. It looks like the little boy at the top of this post. Quiet, trusting, sometimes long-suffering. The art of sowing doesn’t come naturally to us anymore, so maybe we should be grateful for every opportunity we have to practice it, to hope against hope, without words and without proof, with suffering, because one day, it just might come up. What a lovely story of patience that is! And I love that beauty grows out of hope through the small, daily faithfulness. It’s such a lovely little book. thank you for this! may i pass this along to a friend who is in the midst of this patientia? i am certain it will be a help to her..